Before photographs are taken of your home or cottage, we may give an impartial analysis. This will include a detail on how your home relates to "competing" homes on the market, while considering current design and trends that attract buyers. Cottages in Tobermory, Lion's Head, Wiarton or anywhere else on the Bruce Peninsula having both summer and winter pictures can we very helpful. With a critical eye, examine your home inside and out. Determine if there are any small repairs or underlying problems that you are aware of. 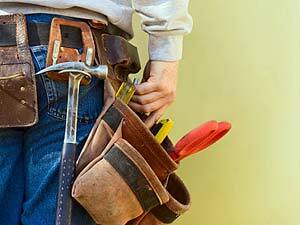 Any small repairs that you are able to complete will help negotiations with buyers. If there are any major repairs, like a leaky basement, you will want to bring them to the attention of your agent. Browse the specific considerations below. For more information, feel free to Contact Us! We would be pleased to help! Put extra emphasis on your kitchen and bathroom. Replace moldy shower curtains and clean mold and mildew off of bathroom tiles. Caulk if necessary. Repair leaky faucets and replace cracked toilet seats. Ensure that the toilet flushes properly. Make certain that the drains are unclogged. Everything should sparkle -- faucets, floors, counters, mirrors. What can be cleaned should be! In the kitchen, clean the stove and refrigerator, organize the cupboards and wash the floor. Make certain your appliances work. Wipe the walls, touch-up paint or re-stick wall paper if necessary. Clean the sink and ensure that it drains properly and the faucet doesn't leak. Note: When your home is shown, make sure there are no dirty dishes in the sink and don't forget to take out garbage! An organized and clean home will appear larger. Ensure that clutter is not just hidden, but organized is the best approach. Buyers will look in drawers, cabinets and closets. Hiding the clutter in those places will make them seem smaller and overcrowded. There are some Great Thrift Shops in Tobermory, Lion's Head, Wiarton and Owen Sound where you can drop off your extra items. When selling a waterfront property in Tobermory, Stokes Bay, or anywhere on the Bruce Peninsula, your Deck & Dock can make or break a sale!